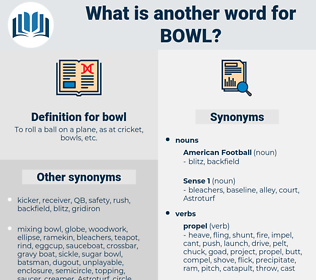 What is another word for bowl? 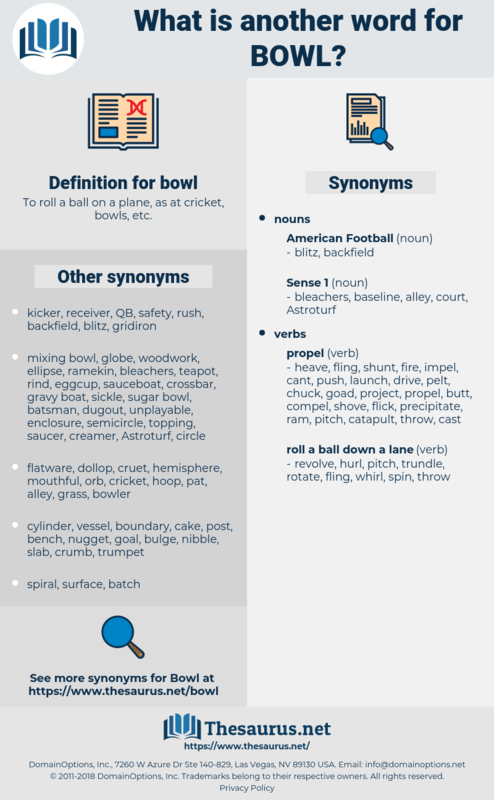 To roll a ball on a plane, as at cricket, bowls, etc. jar, bowler, soup, toilet, bong, receptacle, ball, cistern, plate, pot. This bowl was the weather - bowl. Why don't you ever empty the bowl then? BUOL, boal, bohl, boll, boehl, bole. mazer, jorum, slop bowl, cereal bowl, finger bowl, porringer, fish bowl, salad bowl, goldfish bowl, fishbowl, slop basin, toilet bowl, punch bowl, mixing bowl, soup bowl. incurvation, incurvature, concavity, concave shape.